A while back I received several different books from Titan Publishing Group for review. Titan Books is known for their film and TV tie-ins as well as graphic novels and comics titles. Additionally, they publish popular "coffee table" books dealing with animation, popular culture, collectibles and comic and fantasy art. Watchmen, James Bond, Wallace & Gromit, Transformers, Tank Girl--these are a few of the many familiar characters found in their publications. My Review: Watchmen the movie was released in US theaters on March 6, 2009 (DVD comes out July 21st). Based the award-winning graphic novel by Alan Moore and Dave Gibbons, the rated "R" Warner Brothers movie is crime-conspiracy story. 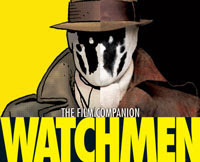 Watchmen The Film Companion provides a detailed behind the scenes view of the movie creation. Each page is filled with lots of photos from production as well as interviews with the cast and crew. I especially enjoyed the large section devoted to the characters in the film. Fans of the Watchmen film and graphic novel won't want to miss this excellent movie tie-in. Product Description: This bumper action-packed volume collects ultra rare Bond stories that have not been seen since their original syndication: ‘Flittermouse’, ‘The Scent of Danger’, ‘Snake Goddess’, ‘Double Eagle’ and ‘Polestar’! 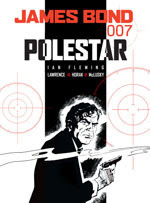 Plus a new introduction by Bond girl Valerie Leon (The Spy Who Loved Me), features on Ian Fleming’s home Goldeneye and a look at the rarely seen Bond Zig Zag comics series, this latest explosive volume is not to be missed! This next book is the first in a series of original novels based on the television show, Primeval. Product Description: When strange anomalies in time start to appear Professor Cutter and his team have to help track down and capture a multitude of dangerous prehistoric creatures from Earth's distant past… and distant future. Win a Titan book! In celebration of the YA Book Carnival, I'm giving away my review paperback copy of Watchmen The Film Companion. • Contest ends on Monday, July 6th, 2009 at 11:59 PM CST. Welcome all blog carnival friends. This giveaway is part of the YA Book Carnival at Shooting Stars Mag. I'm a huge Lost fan so the Lost: Messages From The Island book I would love to have to make sure I'm not forgetting something important! The G.I. Joe: Mission Dossier film companion book looks interesting. I have three younger brothers, and I can't tell you how many times my Barbies 'played war' with their G.I. Joe action figures. I know they are looking forward to the new movie with glee, and a tie-in book sounds like a perfect gift. Watchmen would probably be a big hit, too. +1 Added to the sidebar of my blog at: http://ceceliabedelia.blogspot.com. I think that "Transformers Breakdown" would be great for my two nephews. Torchwood - Rift War by Simon Furman, Ian Edginton, Paul Grist looks like a good read. Please enter me into this drawing. I also subscribe to your feed now. I look forward to reading! Crystal Lake Memories The Complete History of Friday The 13th! I'm a huge F13 fan and this looks amazing. I'm a subscriber through google reader. Lost is my favorite show, so I'd love to check out "Lost - Messages from the Island." I would also be interested in Tank Girl 1: Remastered. Thanks for the giveaway. Very cool books! I'd really like the Ghost Whisperer - Spirit Guide by Ian Sander, Kim Moses and Writing Science Fiction and Fantasy Television y Joe Nazarro. I'm following you through Blogger--thanks! 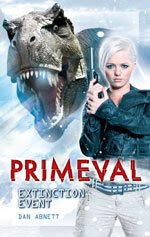 How lovely to learn that there are Primeval books coming out even though the show was cancelled! I'd definitely like to check out Primeval: Extinction Event. The Best of Simon and Kirby looks great! Already a subscriber via google reader! I'd go with Transformers: Dark Star!